Plants, wow! Plants are amazing! 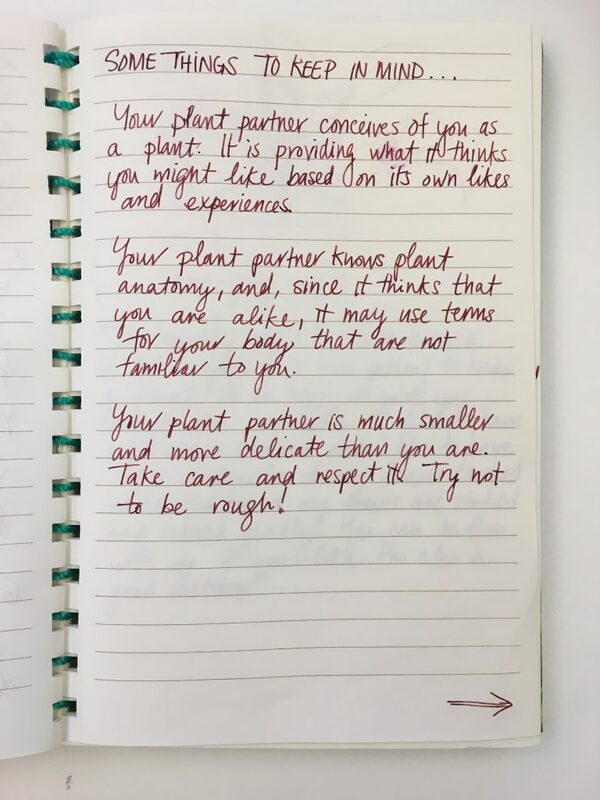 I’ve been thinking of plants as an example of an “other” that could be helpful in conceptualizing designs’ for entities besides the standard human user ever since some conversations last year with Ida Toft. Donna Haraway’s writings are especially relevant here, but here’s an easy-to-digest BBC article about plants and their various sensory abilities and complexities that might serve as an introduction to the subject. I’ve just recently started to split my time between here and Fort McMurray, Alberta. 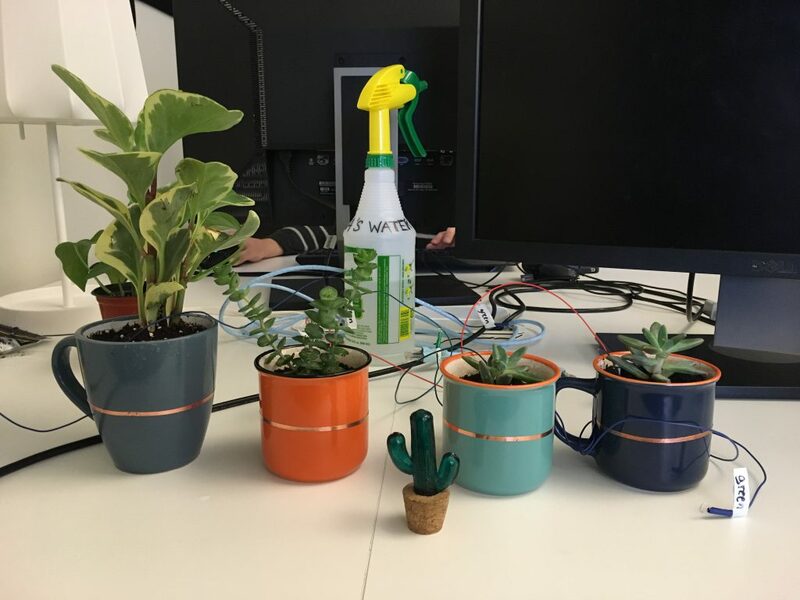 As a result, I had been talking with Squinky about making a plant that people in our lab could take care of that would signal their care to me far away through the internet. To that end, I had ordered things for a tweeting plant project , so I had a sparkfun redboard, some breadboards, some moisture sensors, and some other odds and ends for working with plants. 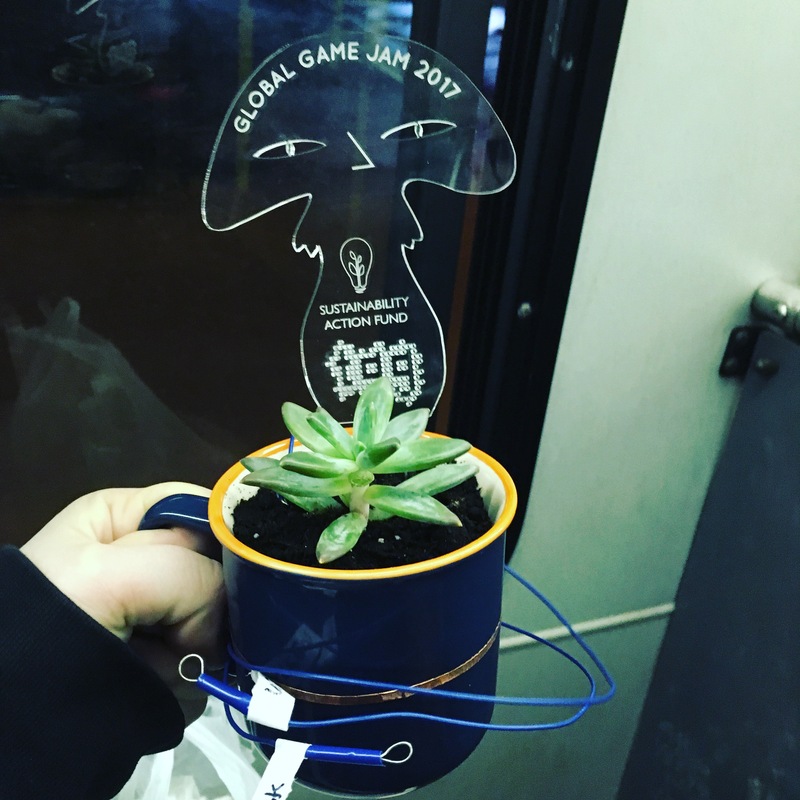 It was only after I had ordered these parts that TAG’s local diversifier for Global Game Jam 2017, Sustainability, was announced. As part of this diversifier, one of this year’s TAG Global Game Jam co-organizers, Liane, acquired a bunch of plants. Our brainstorm quickly turned to what we could make with these plants, and I don’t regret it. Initially, we were supposed to have a third team member, Six, but unfortunately, after the initial brainstorm, they weren’t feeling up to jamming. I just wanted to make sure to highlight their contributions to our conversation, which sent us down some interesting rabbit holes that ultimately lead to us making what I think is a really cool experience. 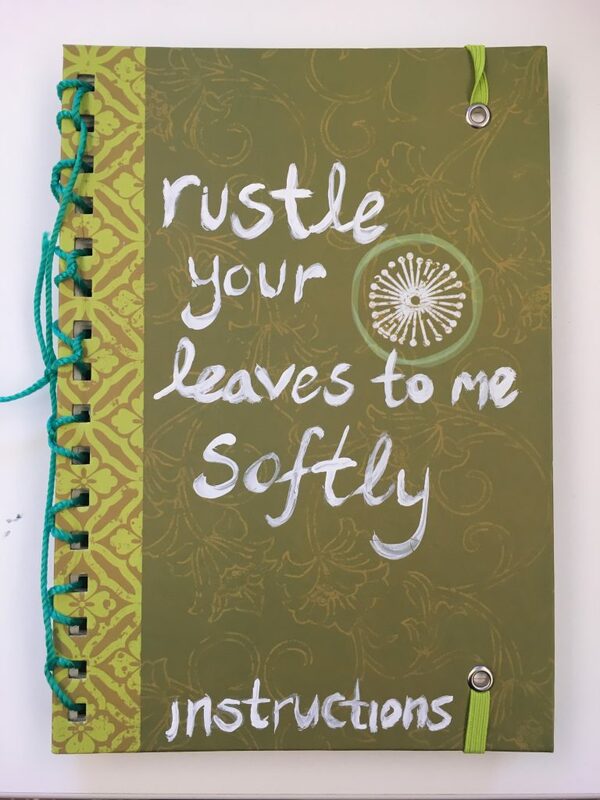 It’s called “rustle your leaves to me softly” and it is an ASMR Plant Dating Simulator. I’ll try to take you through some of our process in this post. This year’s theme was “Waves.” We began to talk a lot about soundwaves and Squinky half-jokingly mentioned ASMR — I of course wrote this down on our brainstorm. We began to brainstorm around the idea of an “ASMRchestra” played by touching various plants. 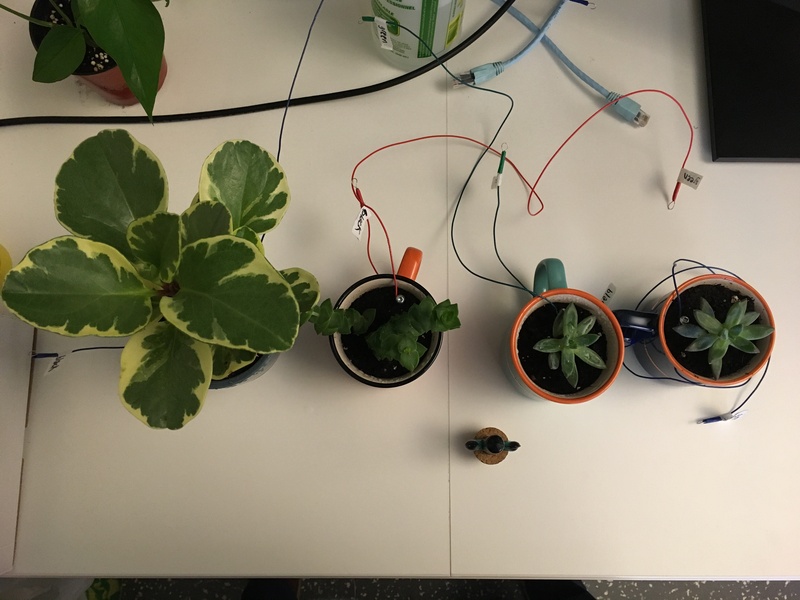 Six suggested a more intimate relationship with one plant, with more varieties of interaction, including flex sensors, touch, sound detection which would activate sound and LEDs on the plant, possibly in an intimate space like the tent. After Six let us know that they wouldn’t be jamming with us, Squinky and I had to scope the design in a bit more tightly to accomplish our work with two people instead of three. As we experimented with the simplest version of what the game could be, we discovered that rather than just being a switch, the redboard could detect consistent/predictable ranges of resistance when hooked up as a button (with a ground, a resistor, and a plain wire). With a strong enough resistor, the ranges of numbers we were receiving varied consistently with softer and firmer touches, and a variety of touch locations (as well as on the person doing the touching – some people are more conductive than others, based on their skin moisture). The ASMRchestra and the more focused single-plant experience were both still possible avenues of exploration, but we didn’t determine right away which we wanted to do. 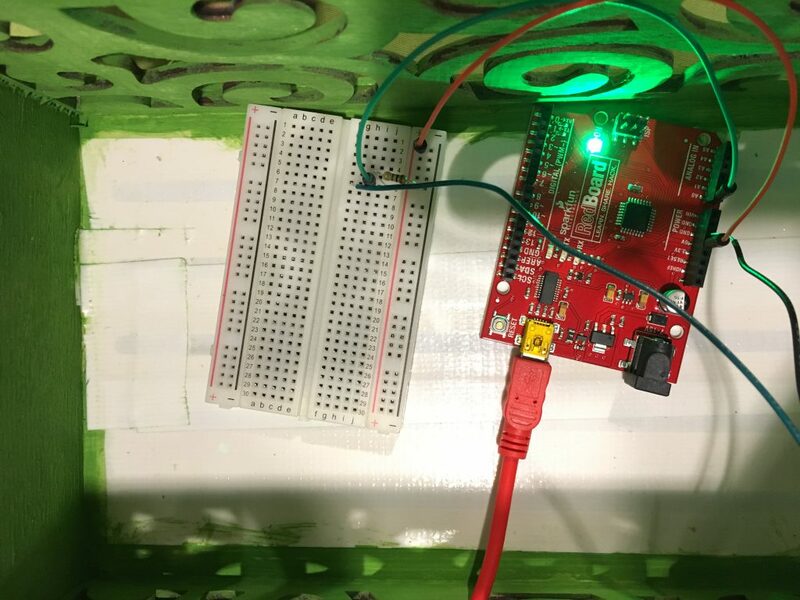 Instead, Squinky focused on the programming, both physical and digital, of the Arduino, determining how things should be connected up, and programming a system that would let us detect the variations in resistance, and play sounds accordingly. They massaged the feel of the interaction with different numbers and adjusted how sounds faded in and out based on those numbers. They found and implemented what we would need to achieve fine grain control over the sound. 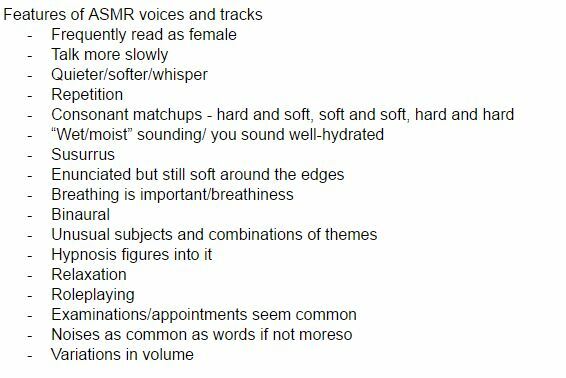 Overall, the ASMR community seems to think that everyone can experience ASMR and it’s just a matter of finding the right triggers. That means that there is a huge variety of possible triggers. What helped us focus in on the kind of ASMR we would be creating was the notion of a reciprocal relationship between human and plant. The human inputs caresses, touches, and other inputs (such as blowing wind across the plant’s surface, or speech) and the plant, in this narrative, responds to the touches that it appreciates by outputting an ASMR soundscape that it hopes will be pleasing to the human. Respect for the ASMR community was important for us, despite what might be considered the inherent absurdity of humans and plants in a sensual relationship like this one (I don’t think it’s all that ridiculous – we are intimately linked to our environment). We wanted our attempts at ASMR to be sincere, despite our limited time to work on it. While Squinky worked on programming, I took up asset creation, including physical crafting. My first task was to select robust plant specimens that would be the least likely to be harmed by our touches as long as we were respectful (I chose one plant with waxy leaves and several succulents). Next, I worked on building controllers/homes for our chosen plants using ceramic cups, river rocks, dirt, copper tape, wire, electrical tape, and screws. The copper tape on the outside of the cup was a convenient and aesthetically pleasing place to put the ground, as people could grasp the cup to steady the plant as they touched it. With Ida Toft’s advice, we used the fact that both the plants and the earth in their pots contained moisture and were conductive to avoid attaching anything to the plants themselves. The screw provided a large contact that I could simply plant in the earth. As usual, a jam involving a good deal of crafting meant that I took several trips to the Dollarama to find and repurpose objects there for the project. We decided early on that we wanted to avoid using screens as much as possible if we could, so, with that in mind, I made sure that what there was to look at instead (the plants, the electronics, the instruction booklet, the housing for the electronics, the table where the game would be played at) would look as unified and as pleasing as possible. Aesthetics when people won’t be completely focused on a screen are important (and of course I’d argue that they’re important in general, with or without screens). Right before the playtest, I found a quiet spot and decorated it with a green tablecloth, setting up just what was needed to play our game on the table. It was a bit removed from the rest of the space since audio was important to the game. I made signs to lead players to the game that said things like “4 plants in your area looking to meet” and the name of our game and team (we were “TEAM TINY CACTUS,” by the way – everytime Squinky and I work on a new project together, we give ourselves a new team name). By Saturday evening, we knew that our game was no longer ASMRchestra, despite that being an excellent pun name. I was concerned that hooking up all the plants up at once would discourage people from discovering their individuality, that it would instrumentalize them in more ways than one: that people would cease to see them as living creatures and see them just as controllers, and that they would just try to play them as instruments simply making sounds instead of responding to the feedback they were receiving. The relationship between each plant and human, with the human taking the time to discover their differences, became an important part of how I was thinking about the game. We retreated to the jam space’s campground (complete with tent) to figure out a new name for our game. Names are important, because they’re conceptual tools — they help me figure out how to think about a game. As we giggled to each other in the intimacy of the tent, we settled on “rustle your leaves to me softly” – it immediately suggested something that we hadn’t considered before: poetry. 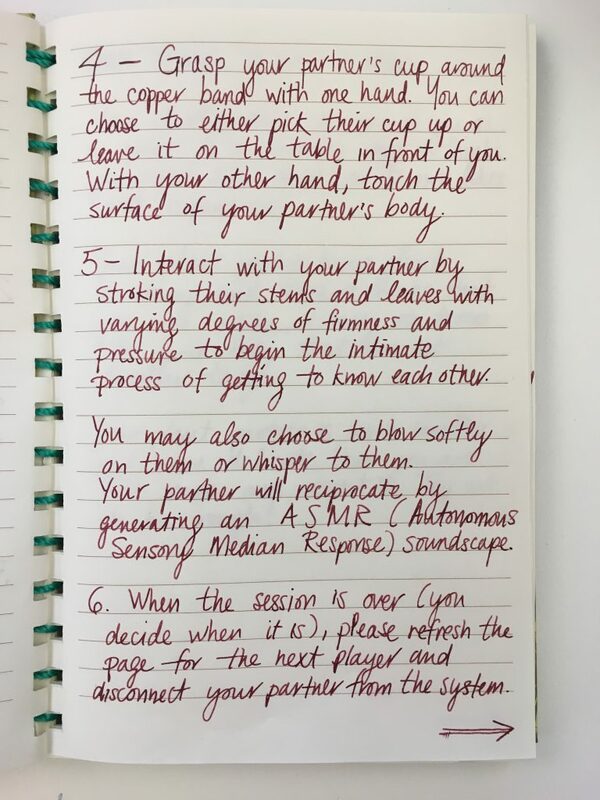 For me, this was the missing piece of the ASMR script. I would write a poem that could be randomized, line by line, from the plant’s perspective. We recorded the poem and other sets of words that night. Here are the word sets and the lines of the poem. You can read the full instructions here, including more plant dating profiles. The conceptual thought behind the game is rather twisty. As designers, we were trying to take on the perspective of plants, thinking in ways that we thought a plant might think, where the plant in question was trying to conceive what a human would appreciate most from them, without understanding just what a human was, and thus thinking of it in plant terms. Based on what we decided plants would like in ASMR, the plants are then trying to please human tastes. Since the sounds could be dropped in afterwards, collecting them and putting them into the game was one of our last tasks. I collected Creative Commons 0 attribution license ambient music tracks, water droplets, rain, rustling leaves, and other sounds (sources can get a bit tricky in the heat of a jam, so I usually use CC0 resources). Based on my notes about ASMR, Squinky and I then recorded a series of plant-related words and the individual lines of the poem that I wrote to be randomized. Squinky then figured out how to layer them beautifully, figuring out volumes and when sounds should stop and start in order for the plant to feel most responsive without the sound design being too busy. 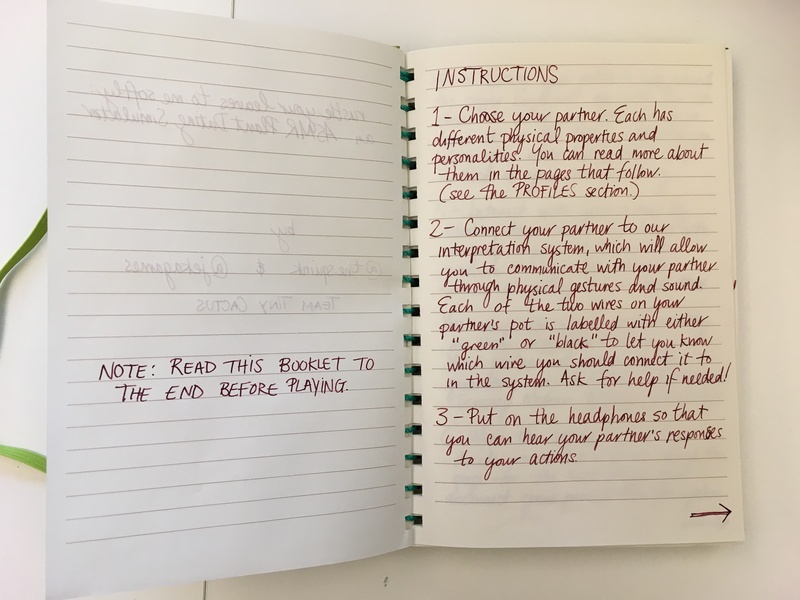 As we playtested the game, I was surprised at the intimacy created by the experience. I was also surprised that the context was so transposed, and that the sound was working so well together, that I didn’t even mind listening to the sound of my own voice coming from a plant. It was eery and touching all at once. The official jam playtest went well, but there were way more people that wanted to play than could be accommodated over the course of the time that we had. This was a good sign, although it was also a shame. Those who did play seemed to enjoy the game. Their first reaction was frequently laughter – I think they laughed out of surprise. Afterwards, they often got quiet, contemplative. Some seemed reluctant to stop playing, but felt the pressure of others waiting behind them to play. Some players also experienced ASMR sensations for the first time. 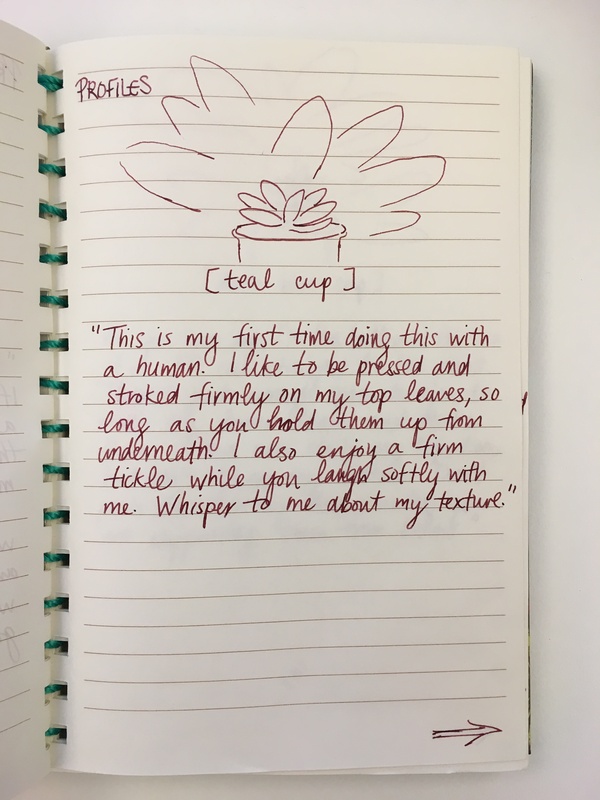 Many seemed to discover that touching the plant felt good – and felt intimate. The textures, combined with the responsive sound, made for a pleasing sensory experience. Thanks to the very talented Matthias Graham (@coraxincarna), who took photos and filmed for us, and Squinky, who figured out a way to record the sounds as people were playing, we were able to cut together a rough version of a video of what the experience is like — unfortunately, without the tactility and without the pleasure of that immediate connection between touch and sound — for those who haven’t had a chance to play. We hope to set up the game at TAG sometime soon so that more folk can play it! There’s more to say, I think, about this game, but I wanted to get out a few thoughts as soon as possible after the jam before they faded away.